Peptide (C)KLLNASVLGDHTKYSK, corresponding to amino acid residues 189-204 of mouse NET (Accession O55192). 2nd extracellular loop. Homology Rat - identical; human - 14/16 amino acid residues identical. 1,2. Anti-Noradrenaline Transporter (NET) (extracellular) Antibody (#AMT-002), (1:400). 3,4. Anti-Noradrenaline Transporter (NET) (extracellular) Antibody, preincubated with the control peptide antigen. Immunohistochemical staining of immersion-fixed, free floating rat brain frozen sections using Anti-Noradrenaline Transporter (NET) (extracellular) Antibody (#AMT-002), (1:200). A. 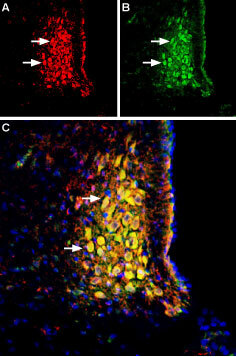 NET (green) is visualized in axonal processes (arrows) in the hilus. B. The relation to layers was explored using mouse anti-GAP43 (red). There are less axonal processes in the outer molecular layer (asterisk) compared to the inner molecular layer (arrows). C. Overlay of A and B shows co-localization of NET and GAP43 in the outer molecular layer. Cell surface detection of Noradrenaline transporter (NET) in live intact rat pheochromocytoma PC12 cells. 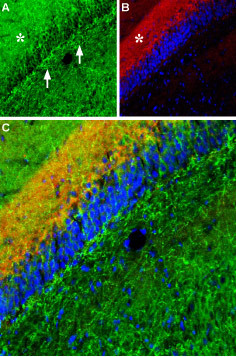 Cells were stained with Anti-Noradrenaline Transporter (NET) (extracellular) Antibody (#AMT-002), (1:100), followed by goat anti-rabbit-AlexaFluor-594 secondary antibody (red). 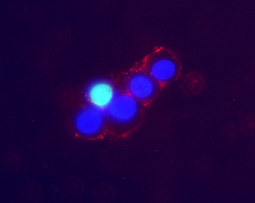 Cell nuclei (blue) were visualized using cell-permeable Hoechst 33342. Siuta, M.A. et al. (2010) PLoS Biol. 8, e1000393. Madras, B.K. et al. (2005) Biol. Psychiatry 57, 1397. Moron, J.A. et al. (2002) J. Neurosci. 22, 389. Kitayama, S. et al. (2001) Neurosci. Lett. 312, 108. Giros, B. et al. (1993) Trends. Pharmacol. Sci. 14, 43. Many physiological, endocrine and behavioral functions are determined and regulated by monoamine signaling1,2. Many brain disorders such as depression, drug abuse, schizophrenia, attention deficit hyperactivity disorder (ADHD) are caused by the malfunction of monoaminergic transmission1-3. The intensity of monoaminergic signaling is determined by the availability of the monoamine, which is in turn determined in part by its uptake from the extracellular milieu via monoamine transporters. These transporters include DAT, SERT, and NET, responsible for uptaking dopamine, serotonin and noradrenaline respectively, and recycling them back for release3-5. While the activity of each transporter is faithful to its neurotransmitter, NET has been shown to clear dopamine in DAT deprived or low DAT regions such as the brain cortex6-8. DAT, SERT and NET are members of the Na+/Cl- dependent membrane transporter family which also includes other members. These transporters consist of 12 transmembrane domains and intracellular N- and C-termini. NET also has a significant extracellular loop between transmembrane regions three and four, which contains various glycosylation sites9. Like its counterparts, NET’s intracellular N- and C-terminal domains are also subject to phosphorylation and protein-protein interactions important for modulating its activity and localization. In addition alternative splicing has also been shown to regulate NET’s expression and function10. NET is specifically expressed on noradrenaline nerve terminals, and is also expressed in the periphery, such as adrenal glands and placenta. NET malfunction is largely associated with attention and mood, as well as various cardiovascular disorders. NET is also a target for psychostimulants such as cocaine and amphetamines which disrupt its function, thereby causing an increase of noradrenaline in synaptic clefts3,9. Alomone Labs is pleased to offer a highly specific antibody directed against an epitope of the mouse noradrenaline (norepinephrine) transporter. Anti-Noradrenaline Transporter (NET) (extracellular) Antibody (#AMT-002) can be used in western blot immunohistochemistry and immunocytochemistry applications. It has been designed to recognize NET from human, mouse and rat samples. Rat basolateral amygdala lysate (1:500). Karkhanis, A.N. et al. (2015) Synapse 69, 385.